Wood pallets first became commonplace in the 1940’s after innovations in the material handling industry. In infancy of pallet usage, the tendency was to use pallets for only one shipping cycle and then throw them away, even if only minimally damaged. Since then, the pallet industry has adopted much more environmentally friendly practices, a shift in perspective that in many cases has been driven by pallet manufacturers themselves. In addition to encouraging pallet repairs whenever possible, pallet manufacturers also prevent pieces of wood beyond repair from being thrown away— instead, they are broken down and turned into mulch for landscaping. It’s organic, recycled and effective. The mulch process gives trees a full life circle: they go from lumber to pallet to mulch, which, in the end, cultivates the sustainable growth of future trees. The first step in the process is to separate the nails from the pallets. A good grinder can separate the nails with a strong magnet, allowing the nails to be melted down with other steel and recycled. Not all grinders are capable of removing the nails, in which case the nail removal must be completed manually. In either case, a good process ensures that few materials go to waste. The wood, meanwhile, gets ground up into woodchips that can be used as soil-enriching mulch. Mulch is a cheap and crucial addition to nature’s growth, with a number of roles to play. In general, mulch acts a lot like fallen leaves in a forest. It helps seal in soil moisture, preventing dehydration on hot days; it insulates the soil, which shelters plant roots from extreme temperatures; and it helps control the expansive spreading of weeds, as well as reducing damage to plant roots from weed whackers and lawnmowers. It’s basically a protective covering that keeps roots and soil safe and healthy. 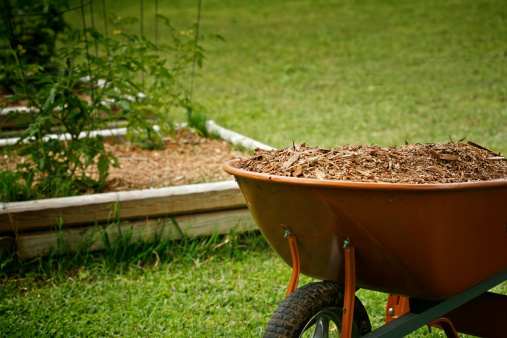 Organic mulch—like wood chips, bark and pine needles—also improves the soil’s fertility when it decomposes. This is a critical advantage of organic mulch over inorganic mulch, such as small stones, lava rocks or pulverized rubber. Unnatural mulches last longer because they don’t decompose, but arborists and landscape professionals generally prefer organic mulch because of the quality minerals that decompose into the earth—even if their shorter lifespan calls for renewal every so often. Besides, mulch is far from an expensive landscaping addition. Natural mulch also ages nicely, emitting a lovely, earthy smell after some time outside. Arborists and gardeners covet natural-colored mulch for adding aesthetic appeal as well as practical duties. And it doesn’t matter if the wood chips in question are hardwood or softwood—the differences lie in texture, smell and color, but anything natural will do the trick. Through these environmentally friendly and sustainable practices, pallets now find a second life as organic mulch, beautifying and protecting trees and gardens everywhere. This simple recycling process brings the lumber full circle in an eco-friendly lifecycle, and provides an economical and beautiful option for arborists and hobbyists.